24th November 2016, Port Moresby: JENNIFER Oii, a young mother of three is a traditional weaver; a skill she acquired from an elder in her village of Kukipi nestled by lowland river deltas and grassland flood plains in the Gulf Province. A year ago, Jennifer and her husband, James set up Kukipi Women’s Weaving Cooperative, an initiative to tap into the informal sector, thus make a living from the weaving skills of the women in the village. Today, the group has eight members, ages ranging from 16 years to 50 years and have now branched out to men making traditional shields and carving apart from the pandanus fans, mats and placemats. 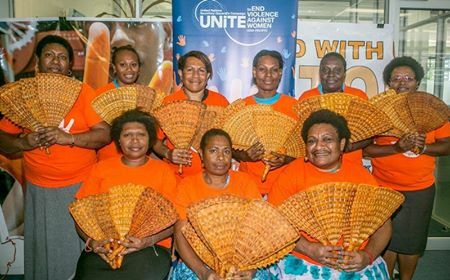 The cooperative’s latest project was an order from the UN Women (PNG) office for 200 orange pandanus fans to be used to “orange the world” during the United Nations Secretary-General’s Campaign UNiTE to End Violence against Women in the country. Pictured are UN Women (PNG) staff members posing with some of the 200 fans which took Jennifer and her friends three days to complete. The fans which are naturally beige were painted orange to symbolise a bright and optimistic future, free from violence against women and girls. Jennifer said that by making the fans for UN Women, her small group has learned about the significance of her contribution to a global campaign such as “Orange the World: UNiTE to End Violence against Women”. Kukipi Women’s Weaving Cooperative’s 200 pandanus fans will certainly splash a generous amount of orange in this part of the world.